To Earl Blackwood he was “…that string bean kid what couldn’t fight his way out of a wet paper sack.” Earl Blackwood owned Richfield’s one tavern. Burly men from the co-op guzzled beer there with rawboned ranch hands while listening to honky tonk music and belching at each other. Earl’s son pushed other kids around a lot and walked with a swagger. The other extreme of convictions about David came from Mr. Thompson. He owned the insurance agency, the Cameo Theater (shows Wednesday, Friday and Saturday, unless the bus from Boise was late with the film), and five of Shoshone County’s biggest potato cellars. To Mr. Thompson, David was “…a nice kid with plenty of smarts. He’s going far, you just mark my words.” His own son lisped and got straight A’s. And the string bean kid with plenty of smarts saw himself as puny next to Randy Blackwood’s strut, futile and stupid when he compared himself against Brian Thompson’s shy intellect. Of course there was a middle ground too, seen by a few folks with more perception and tolerance. He was a rangy boy with a promise of future heft in his shoulders, and a healthy curiosity melded to above average intelligence. But, because David had never explored this median ground between the Blackwood and Thompson appraisals, his sensitive features were often troubled by dark eyes where doubt haunted. Always reluctant to join others in minor turmoils and vandalisms, he huddled turtle like in his bibbed overalls, awed by boasts of sparrows turned loose in the Cameo, impressed by the daring that drove Randy Blackwood to overturn privies, dazzled by headfirst dives from irrigation canal bridges. He wanted to do all those things, but didn’t think that he’d really like doing them. He understood the difference. He took more pleasure from the smell of wet sage after a summer shower, in the downy feel of freshly laundered shirts his mother made from old flour sacks, and in fetching the cows each evening on Lady, the ancient mare with undemanding eyes. As influenced by the nine years of his life, these were David Morgan’s simple enterprises and troubled thoughts---until he first glimpsed his own mortality. The Snyders were hosting the class picnic, held each year just before the last day of school. Hide-and-seek was the current game and David raced barefooted across the farmyard towards a giant cottonwood behind the barn. Gusts of aimless wind played with a distant cadence “…seventyfiveseventysixseventyseven…” Summer’s promise billowed in lazy white clouds. He pulled himself up into the tree’s secret shade. Sap was sticky on his hands, green-sweet in his nose. Leaves swollen with new life rustled. He was suspended in a high quiet place all his own. His seeking toes scuffed fine, white cottonwood powder from limbs where no other feet had ever touched. The powder was like the talcum his mother still patted on her face to hide the last dark bruises. Through the leaves he watched Frances Silvey trot around a corner of the farmhouse, away from his lofty hiding place. The tree and its whispering leaves promised that even if she looked right up into it he would be safe and hidden. He would be the last to touch base and shout, “FREE!” He’d lost the foot race, and had fallen in the sack race, but he’d win hide-and-seek. His stomach was taut with hot dogs, marshmallows and lemonade. In the afternoon stillness drowsiness crept in and he leaned back against the smooth gray bark. He glanced down at his right foot. Blood trickled from a scratch. A thought came to him: Lose too much of that stuff and I’ll die. The blood looked just like the bright-red stream that had oozed from his mother’s nose and split lip. All at once he was cold. Suddenly the shaded refuge was filled with unseen things, dark and scary. The bark under his feet was slippery and dangerous and he clung to brittle branches that could break at any moment. Weak and trembling, heart pounding in his throat, he desperately hugged the trunk and inched downward. Finally he was on the ground. He fell back against the tree and fought not to throw up. Again he saw himself stumbling into the night, away from his mother and the sound of his stepfather’s thudding fists. Since that night he’d prowled about the farm, searching in the dim barn for some nameless lost thing, listening for it above the rustle of mice in the loft, trying to sniff it out of the dry air where beams of dusty light probed. Unsatisfied, he’d fling open the granary door and stepped quickly into the cool mustiness to surprise the elusive thing before it got away again. Frances Silvey shrieked at him. “Davey Morgan! I see you under that tree.” With a sense of detachment and the hovering panic still gripping him, David turned away and began the mile-long trek home with only his shadow for a companion. On Sunday the sound of a car once more brought him to his feet but, as it had each time that day, the dust rising above the road dwindled away with the retreating car. He slouched back to the gray couch in the living room. Dust from worn chintz rose when he flopped onto the bumpy cushions. As the hours wore on and Tad Moreland didn’t come it was getting easier to believe that he never would. Each fading cloud of dust taught him the value of not hoping so much the next time he heard tires on the road. In mid-afternoon he wandered outside and slumped against the broken well framework to stare out across sagebrush flats. Beyond the barn the plain went off into late-spring haze, then lifted into distant mountains. They were far away, more unreachable than ever. His mother came to the door. “Don’t worry, Davey,” she said. “Tad’ll be along any time now.” She smiled, then winced around the bruises and touched her cut lip. Who cares if he comes or not? Big deal. Probably wouldn’t catch any fish anyhow. Like the time his mother had coaxed his stepfather into letting him tag along down to Dairy Creek after the evening milking. He’d never handled a rod and reel before. The old rusted Penn his stepfather thrust at him back lashed when he tried to cast, or the line snarled in frayed wrapping around bent rod guides. Finally, after squirming for an hour under his stepfather’s impatient grumblings, he stopped asking for help. His stepfather though caught one shining trout after another. He used fat, white grubs for bait, plucking them from cool dampness under rocks and rotting logs. The fish were sleek and clean looking, bright things that caught the light with shades of metallic green-blue spotted by dainty red and orange highlights. David imagined how they glided smoothly through the water, untroubled by current, masters of their world. He thought that he could probably catch one too, with the white grubs. Instead he just sat watching, comfortable with inadequacy. He was almost as comfortable sitting on the well framework now while he forced himself not to hope that Tad Moreland would still come. For a time he watched the placid drift of clouds sporadically shade the sun. The world seemed to change somehow as the light waned. Puzzled, he looked around as the day first darkened then brightened. In the few moments between clouds the orchard below the house was full of an almost remarkable light. He could see far down the rows of trees through the glowing air. Then the shadows would come again and everything looked heavy and chill and he would feel sad, as though the sunlight would never return. Lost in reverie, David didn’t notice the car stop out front. When he looked up Tad Moreland was walking towards him. Tad Moreland’s thin hair was straw colored, his eyebrows above light-blue eyes bushy and scruffy. Somehow he didn’t seem as tall as he had in the deputy’s uniform with the big badge shining on his shirt. Davey saw two other boys waiting in the car and felt sudden disappointment; he’d thought that it would be be just him and Tad. He remembered how they had sat right here on the well railing, the deputy’s hand resting on his shoulder. They had shared something private in those moments as his terror slowly faded. Davey picked at splinters in the weathered wood. “Nothin’ happened to me,” he muttered. “Mom’s the one got beat up.” Did Deputy Moreland know how scared he’d been? Even worse, did he know how he’d run away? But nothing had been said about anyone else coming along. Davey felt betrayed as he followed Tad towards the car. His mother walked with them. In the front seat Andy Barrows sat slouched with one arm curled out the open window. Short dark hair sharpened his features into a hardness focused in flat-gray eyes that challenged Davey from beneath heavy brows. Andy Barrows was the one who always thought of pranks, like catching sparrows to turn loose in the Cameo. He was always the first to dive from the highest irrigation canal bridges and lead raids to push over outhouses and ravage watermelon patches. Another boy Davey vaguely recalled from school, a new kid with pale eyes who’d transferred in just before Easter, huddled in a corner of the back seat. Rich something-or-other. They drove away from the house and down the rutted road, passing a field where his stepfather labored with a shovel to coax a little more water from an irrigation ditch. He’d tried to carry a shovel like his stepfather did, with an arm looped over the long handle, but it made his shoulder ache and rubbed a raw spot. The first year on the farm the same kind of thing happened after his stepfather made him help with the haying. He lacked both the strength and technique to pitch the alfalfa bails up onto the wagon. His soft hands blistered. The dry hay plugged his nose and sent him into fits of frenzied sneezing. His stepfather had given him an old pair of leather work gloves, but his mother had still protested. The gloves couldn’t protect his back; it was too weak for heavy lifting. She’d soaked his hands in warm water cloudy with Epsom salts and massaged his aching shoulders. He should have tried harder. Maybe things would have been different, but he simply didn’t know how to do much of anything, like milking a cow or cleaning the stoves of day-old clinkers. Some nights after he’d gone off to bed he’d hear his stepfather shouting. Davey never heard her answers, but as time went on his stepfather ignored him more and more. Tad Moreland had told him that sometimes a man just had to explode when his load got too heavy. It was clear to Davey that he had become part of the load that had burst from his stepfather and over his mother. They parked in willows where shadows sprang from dark basalt bluffs along Wood River. Andy Barrows snorted. Barrows scowled at the ground and held back as they went down to the river. Rich tagged along listlessly. The handle of his fishing rod dragged through brittle grass along the bank where swarms of grasshoppers rose darting and clicking in the stillness. Davey took the rod Tad handed him and thought about catching the first fish. With such a beautiful rod it could just happen. He’d show them all…Tad Moreland, Andy Barrows, and the quiet kid too. “Knock it off, Andy,” Tad ordered. He showed them how to sweep their caps over the grass to catch grasshoppers. Andy Barrows climbed one of the nearby bluffs and sat aimlessly tossing rocks into the river. Davey stared at the spot where his line disappeared into the dark water. Come on, fish…come on! Next to him, Tad jumped then reeled in a flopping trout. “Well, what do you know about that?” He sounded contrite. Davey reeled in to check his hook; the grasshopper was gone. “Make me, Davey, you little sissy runt. You ain’t got your mommy here to pertect you, so what you gonna do?” He leaned in towards Davey, chin thrusting. Swift nighthawks swooped and wheeled in the early evening quiet. Davey’s mind, lulled by the whisper of oily waters along the bank, began a retreat into personal depths. . .then suddenly rebounded. Something struggled for awareness while at the same time a steady anger began to burn. Some personal capacity for absorbing injustice overflowed. Nearby was a thicket of willows where it would be cool and dark. It would be nice just to relax in the dimness and forget about his mother and stepfather and Tad Moreland and Andy Barrows and. . .trying. Instead he went slowly through the slender trees and dug in the moist compost for grubs. Barrows squatted on the low bluff again and gazed blankly down into the water. Davey threaded a fat grub onto his hook. He tossed it into a deep eddy near the base of the bluff. His mind now was clear and steady. He felt the baited hook tap along the bottom. The confused backwater tugged at the line. The bait paused for a moment and then, without warning, a stunning force lashed up along the monofilament, down the rod and into his hand. A great heaviness pulled against his muscles. The water exploded and foamed where the fish surfaced. The thing at the end of his line was alive and wild. It rushed off towards the fast current in mid-channel. Davey lowered the rod tip as frightening pressure built against the rod’s slender length. It bowed almost double. The fish slowed, paused and held back, planned its next move. In the brief calm Davey felt his heart pounding and massive in his chest. He needed to swallow but his mouth was dry, throat clamped by dread and near panic. At the same time exhilaration flashed; he felt part of something great and beyond himself. Only after Davey could no longer see the water any more did he realize that time had passed. Tad brought a flashlight from the car. How long had it been? Would it never end? Davey waited for the line to snap, the rod to break. Sooner or later it must happen. And then, magically, it was on the bank. Davey didn’t know how it had gotten there, or what he had done to cause such a miracle. He stared numbly at it shining in the flashlight beam. Its mouth gasped spasmodically. Davey just stared. It was a mystical creature of fantasy, strong and wild, merely tamed for these few moments as it fought for life. Andy Barrows bent to pick it up, and in that instant some intimate spirit sprang from the trout and rushed through Davey like a fever. His head snapped around, eyes suddenly fierce and flashing. “Keep your damned, stinking hands off my fish!” Barrows recoiled as though he’d been slapped. Davey reached down and gently removed the hook from the bony jaw. He splashed water along the glistening sides. The trout quivered when he tenderly lifted it with careful hands. “What the hell ya doin’?” Barrows yelped. 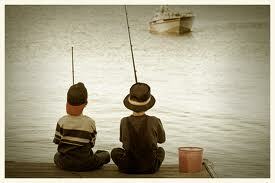 As if knowing its fate, the fish rested quietly in Davey’s hands. He eased it back into the water. His fingers came away from the muscled slickness and he felt the trout’s buoyancy. With one quick flash of its spotted tail it lunged for dark river depths. Davey didn’t look back at the river as they drove away. There was nothing there to see now, nothing left but darkness. He leaned forward and watched the headlights push ahead, straining against the night.